Since the release of Alec Bradley's breakout Tempus cigar, the company has shifted its focus towards Honduran and Nicaraguan tobaccos, offering flavor-forward cigars with edgy concepts and designs. The bulk of Alec Bradley cigars are crafted in Honduras, but with Alec Bradley Nica Puro, the company had its eyes set firmly on Nicaraguan leaf. Puro cigars are a tradition as old as cigar making itself. The term translates to "pure," denoting a blend that is constructed entirely from tobaccos of a single country/origin. Cuban cigars are the most obvious examples of such a blend, with the terms "Cuban," "puro," and "Habano" often being used interchangeably. But there are puro cigars available from each of the major cigar-producing regions, allowing the cigar to showcase a quintessential example of a given region's flavor profile. 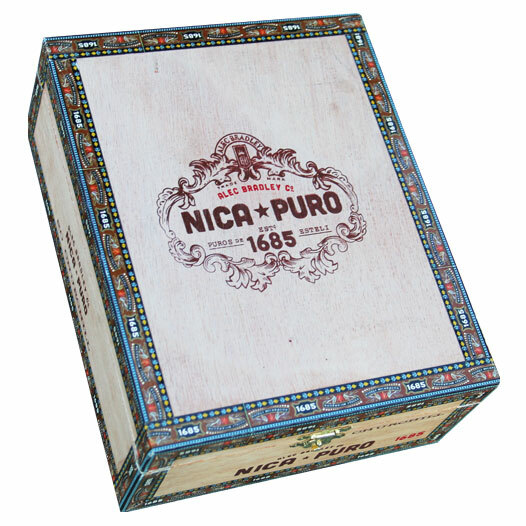 This is the idea behind Alec Bradley Nica Puro, highlighting Nicaragua's sweetness, spiciness, earthiness, and strength. The blend includes Nicaraguan leaf through and through, and is topped with a dark and oily Nicaraguan Habano wrapper. The profile falls in the medium-full range, showing flavors of heavy cocoa, pepper spice, natural tobacco, cinnamon, and freshly tilled soil.